The Orbital ATK L-1011 carrier plane, the Stargazer, is seen in midflight during its first attempt to launch NASA's CYGNSS hurricane satellite mission aboard a Pegasus XL rocket (visible here attached to the plane's belly) in this photo taken from a chase plane on Dec. 12, 2016. NASA aborted the planned launch of an eight-satellite fleet for hurricane monitoring on Monday (Dec. 12) due to problems with its launch system, agency officials said in a mission update. 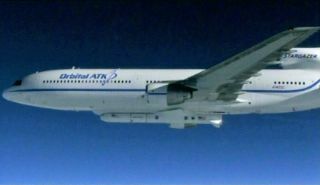 The $157 million Cyclone Global Navigation Satellite System (CYGNSS) was slated to soar into orbit on an air-launched Orbital ATK Pegasus XL rocket, but a hydraulic pump used to release the rocket from its L-1011 carrier plane had a problem, agency officials said. Here's NASA's statement: "Today's launch of NASA's CYGNSS spacecraft has been scrubbed due to problems with the hydraulic pump that controls the release of the Orbital ATK Pegasus XL rocket from the L-1011 carrier aircraft. A hydraulic pump aboard the Orbital ATK L-1011 airplane, which is required to release the latches holding Pegasus in place, is not receiving power. Teams will assess the issue after the plane lands. The aircraft is on its way back with the Pegasus XL rocket still safely attached. The next possible launch opportunity is Tuesday, pending resolution of the pump issue." The L-1011 carrier plane took off from the Cape Canaveral Air Force Station in Florida ahead of today's launch attempt and will return to the station to land and be readied for a possible Tuesday launch attempt. NASA TV will broadcast that attempt starting at 7 a.m. EDT (1200 GMT), with the potential launch at 8:24 a.m. EDT (1324 GMT). "We did battle a lot of weather today, and we were able to fly around and over and under a lot of precipiation and bad clouds on the way out to the drop point," Dunn said. "We have a very dynamic system in Pegasus; it's a beautiful launch system to allow you that type of flexibility, [but] just like any other launch vehicle system that we use, you do have hardware issues that crop up." "Weather looks slightly better for tomorrow, so that looks like it won't be as troubling an issue as it was today," he said. "Really the open item is will we be able to solve this hardware anomaly and then get our folks the necessary crew rest this evening to get back on console in the early morning hours tomorrow." Here's a NASA description of the CYGNSS mission from NASA: "CYGNSS will utilize a constellation of eight microsatellite observatories that will be placed in a circular orbit more than 316 miles above the Earth's surface. With an orbital inclination of 35 degrees, the small spacecraft will concentrate on the region nearest the equator — the tropics — where these cyclones form." Additional reporting by Sarah Lewin, Space.com staff writer.